This officially licensed reproduction sword from The Lord of the Rings trilogy is Anduril, the sword of King Elessar of Gondor. Anduril was forged from the shards of the sword Narsil, carried by Aragorn, the heir to the throne of Gondor. Aragorn wielded Anduril against the forces of Sauron and assumed the name of Elessar once the final victory was won. This top quality replica measures 52 7/8" in length and features a 40 5/8" double tempered, 420 stainless steel, false edged blade and is of rat-tail tang construction. The leather wrapped handle offers a solid metal cross guard and pommel with an antique silver plated finish and 24K gold plated fittings. Both the blade and pommel contain rune inscriptions in the Elven language of Quenya. This sword includes a 11-3/4" x 23" x 3/4" wall plaque with silkscreen symbols of the Kingdom of Gondor, hardware, instructions, and a parchment certificate of authenticity. See Model UC1396LTNB for Anduril Scabbard sold separately. 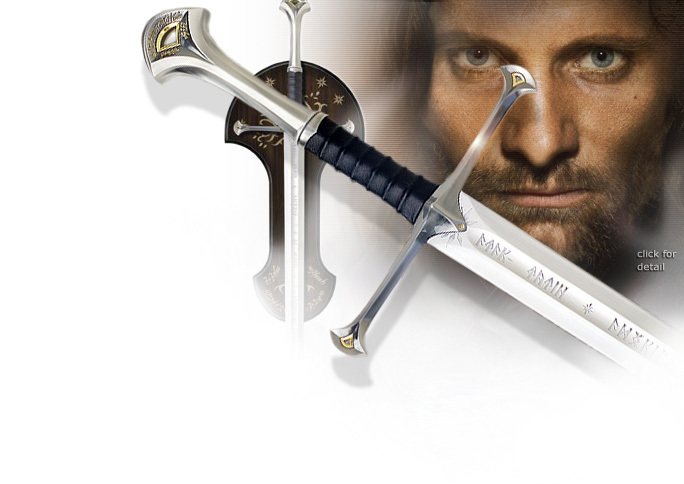 Narsil™/Anduril™ are perhaps the most famous swords in "The Lord of the Rings" trilogy. At the end of the second age of Middle-earth, Narsil’s blade was shattered, as Elendil fell during the Last Alliance of Elves and Men in the great battle against Sauron, creating the Shards of Narsil™. Isildur, Elendil’s son, then used the broken hilt of Narsil™ to cut "The One Ring" from Sauron’s finger, breaking the bonds of his power, banishing his evil shadow into the darkness. The Shards were kept in Rivendell, the house of Elrond, for safe keeping. Legend told that the sword would one day be reforged and the king would return. In the New Line Cinema film, "The Return of the King", Anduril™ was reforged from the Shards of Narsil™ for Aragorn by elvensmiths in Rivendell. Elrond said of the legendary blade, "The man who can wield the power of this sword can summon to him an army more deadly than any that walk this earth." The inscription down the length of the blade on both sides is in the Tolkien language of Quenya, written in the runes of Eregion, that say "Nányë Andúril i né Narsil i macil Elendilo. Lercuvanten i máli Mordórëo". This translates to "I am Andúril who was Narsil, the sword of Elendil. Let the thralls of Mordor flee me." The blade inscription features runes framed by stylized symbols of the Sun and the Moon, which represent Anárion and Isildur, the sons of Elendil, and seven symbolic stars that represent Elendil, who died wielding Narsil™ in battle against Sauron. Inscribed on the pommel are runes in the Elven language of Sindarin that say "Narsil essenya, macil meletya; Telchar carneron Navarotesse". This translates to "Narsil is my name, a mighty sword; Telchar made me in Nogrod".